A middle-aged man and a woman in advanced years are facing a bitter divisive plight related to their possessions and people once close to them after they won a lottery jackpot in Vietnam. 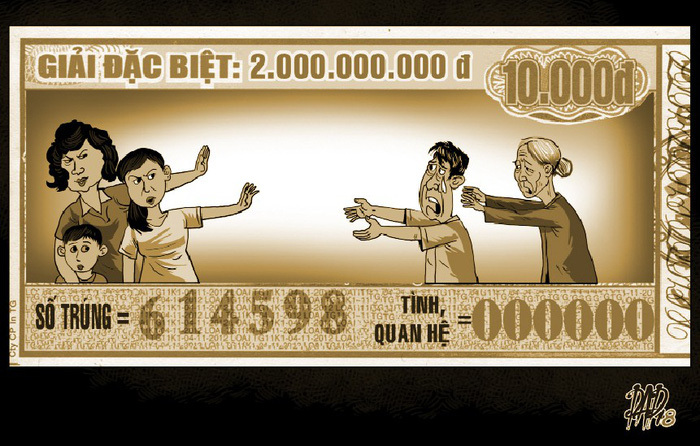 Nguyen T., a 48-year-old resident in Tien Giang Province, had his life trajectory veered unpredictably when he received a lottery windfall valued at over VND11 billion (US$484,580). He contributed a portion of the winnings to a charitable foundation, put some in a bank, spent VND2.7 billion ($1.2 million) purchasing a house, and gave VND1.5 billion ($66,000) to his second girlfriend. He said that problems occurred when his ex-girlfriend found he and the new lover had a baby – a pre-marriage result treated with social stigma in Vietnam – and was bent on depriving him of what he had. The former girlfriend forced him to commit himself to selling the house to her and hand her the accommodation’s ownership papers for safe keeping, in order to forestall his secret attempt to give the building to the new girlfriend. T. was also coerced to sign a document which stated that he owed the first girlfriend VND800 million ($35,000) – the money he borrowed from her when they were still on good terms. He acquiesced for fear that his second love affair came to light. But the woman sued him for the debt and house after he rejected her requirement that he disown the born-out-of-wedlock baby and its mother. He decided to stop serving as a local police chief after the woman reported his affair to the department where he worked. In legal proceedings that lasted four years, the first girlfriend claimed no knowledge of a romantic relationship with T., and said T. used the money she loaned to him to buy the house, a statement that T. contradicted. The judge concluded that he was indebted to the woman, based on a misleading document from the bank in which he mistakenly was categorized as borrowing a sum of money from the institution to purchase the house. The building was auctioned to pay the debt to the ex-girlfriend. “I used to have a job, a house, a large amount of money that everyone would crave. But now I’ve lost my shirt. I can’t imagine I’m driven into a corner like this,” he said. Pham Thi D., residing in Dong Thap Province in the Mekong Delta, entrusted the jackpot payout of VND1.5 billion ($66,000) to her fifth daughter, who she believed would take care of her during the rest of her life in her house. D. is a poor 70-year-old widow of eight children, who are adults only able to do manual jobs as they have no decent formal education. She asked the daughter to spend part of the money on house repairs and divide the rest amongst her siblings but the child did not obey her. “I’ve used all your winnings already. Now mortgage the house so that I have some seed money for business, won’t you?” said the daughter. D. dismissed the suggestion flat-out but later felt shocked to know that the house had been made to be in the child’s name. A bank announced it would take possession of the house since the daughter owed it an outstanding debt, prompting D. to borrow money to solve the issue. The mother was forced to file a lawsuit against her daughter, asking the court to invalidate the house’s papers showing the child was the owner. They have been in litigation over the past four years. “Very much to my regret, I gave all the big money to her. Now the family is falling apart,” D. said.